Not only is Jodi a sought after performer and instructor, but her lifelong experience in the theatre arts has primed her to be an excellent addition to stage and production crews. Jodi co-produces the annual dance festival, North Bay Bellydance Bazaar, and the monthly variety show, Baxtalo Drom-The Lucky Road. She is the stage manager for the Hubba Hubba Revue (voted top 10 best burlesque shows in the world), as well as co-hosting their weekly shows. Jodi co-directed/produced Zoe Jakes' House of Tarot show in Oakland, Ca in 2014, where she oversaw acquiring the venue to making sure every other detail was taken care of. As well as being a featured dancer for Beats Antique, she is also assistant tour manager, wardrobe mistress, and backstage manager. Jodi produced a monthly variety show in Sebastopol, Ca, called Risk-A Cabaret, which featured bellydancers, burlesquers, circus and drag acts, and a different live band every month. The show ran for a year at Aubergine After Dark, and is now succeeded by Eva D'Luscious' show, Cabaret de Caliente. In 2005, Jodi took over Long Valley Dance school in Laytonville, CA for two years. As director, she offered classes in Tap, Jazz, Ballet, Hip Hop, Modern, Tumbling, and Bellydance to students age 3-70. She herself taught 10 classes a week and oversaw 4 other instructors. Jodi's first art modeling session was with Stanley Mouse (of Grateful Dead fame) in 2007. Since then, she has sat for private drawing groups and has worked as a model for the California College of Art since 2012. She currently models at LAAFA (LA Academy of Figurative Art), as well as with private drawing groups around the Los Angeles and Portland, OR area. Upcoming art modeling dates HERE! Jodi learned the art of sushi in 1996 from Sandra Wake, 2nd generation sushi maker and co-owner of Tsunami restaurant in Willits, Ca. 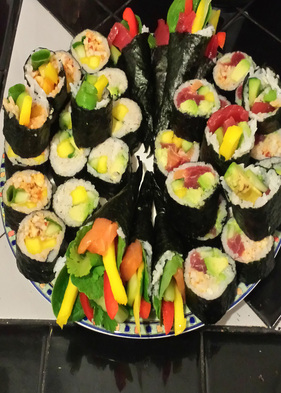 Jodi worked at Sandy's restaurant for 9 years, and since then has developed her own style of sushi, while keeping the traditional form intact. Jodi has her Serv Safe Certificate and uses only the highest quality ingredients, all organic if possible, and is adept in creating both traditional, fusion, and vegan options.